While Europe was enveloped in the Middle Ages of kings, queens, and war, Japan was undergoing its Feudal Era, a time that is now typically seen as Japans medieval period. Many great figures came out of this period, including the samurai and ninja that Japan is so well-known for, and we pay homage to these figures in our oriental statues and collectibles section. Two groups of warriors are featured prominently here, and it was these two groups who helped to define the history of Japan. 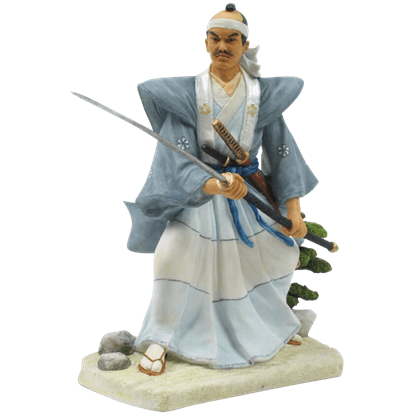 Our samurai statues depict these devoted and almost legendary warriors in a variety of poses and styles. Many of our samurai are true to their historical counterparts, possessing the classic armor of the Japanese warrior, as well as the weapons, so you will find the katana-wielding samurai who mastered kenjutsu (or the technique of the sword) and the bow-wielding samurai who mastered kyujutsu (the technique of the bow) here. Of course, we also feature Japans other legendary warrior, the shinobi, in a variety of impressive ninja statues, which depict these fearsome shadow warriors in a variety of positions wielding a variety of weapons, including the katana, the tanto, the kama, the shuriken, the sai, and the grappling hook. If the time is right, you might even find a few figurines from Japanese myth here, too! 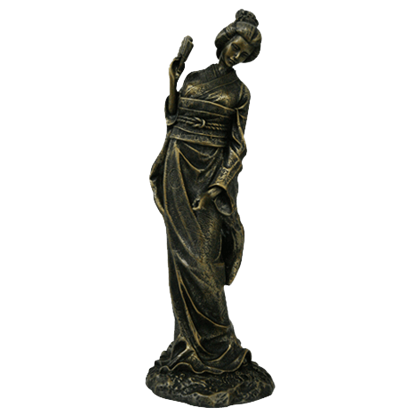 Of course, Oriental statues do not just include those of Japanese styling, so from time to time you will find other statues from other cultures, including, on occasion, figures from Chinese history and myth. For some, the Feudal Era of Japan was one of the most interesting periods of history, and for those who align themselves with the Japanese warrior and all their might, these oriental statues are great decorations and great gifts to give to all those who share an interest in oriental culture and history. 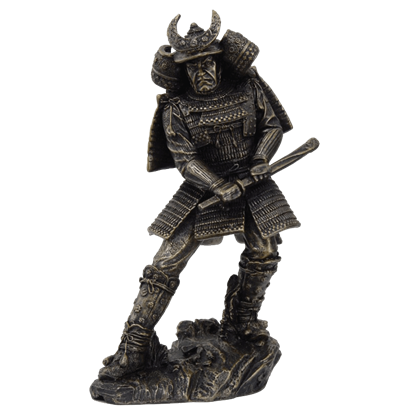 Our Battle-Ready Samurai Statue features an oriental warrior poised for combat, only seconds away from brandishing his sword from his sheath. His expressive face is matched by the intricate detailing of his armor. When guests arrive at your home, the outside of your door can say a lot more about you than you might think. 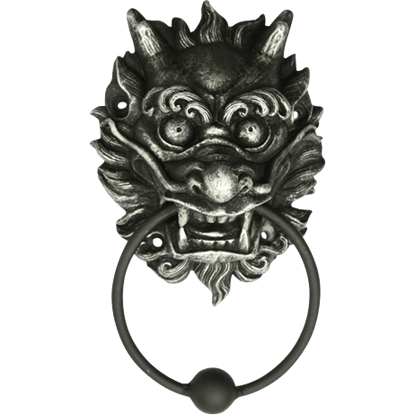 Allow the Cheerful Oriental Lion Door Knocker to invite everyone who pays you a visit inside with a smile and some flair. The samurai was the fierce warrior that came out of medieval Japan. 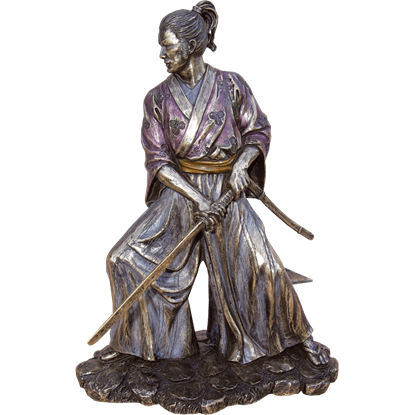 With their famous katana and bushido code, warriors like the one seen in the Downstroke Samurai Statue became symbols of honor and skilled combat around the world! One stroke of the sword is sometimes all a warrior needs. 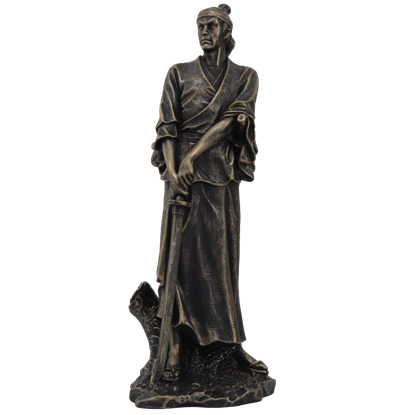 This Downstroke Samurai Warrior Statue depicts one of Japans legendary elite as he brings his sword swiftly down, leaving enemies that he might have faced defeated and gone. Dragons make powerful symbols in many cultures, appearing in many stories and pieces of stunning artwork. 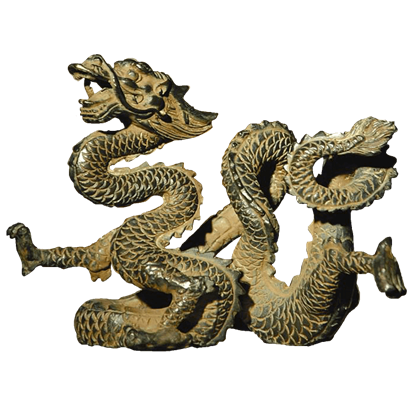 The Dragon of the West Wind forms a dramatic sculpture with excellent details for any home decor. The act of drawing a sword, to the samurai, was very important. They had martial arts devoted to it! This Drawing Samurai Warrior Statue depicts one moment when the samurai begins to unsheathe his blade to enter combat. Few elements from Japanese culture have pervaded common culture so extensively as the geisha, the traditional female hostess and entertainer. 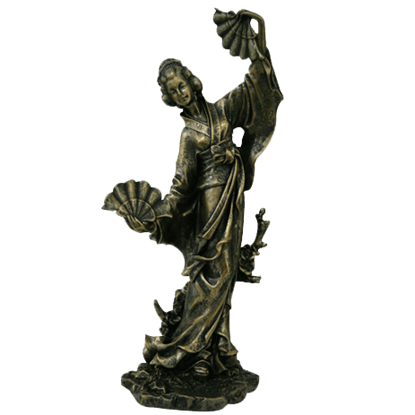 The Fan Dance Geisha Statue displays one elegant lady mid-motion in dance. Representing protection of their dwelling places, lions are often placed outside the home in the Chinese culture. 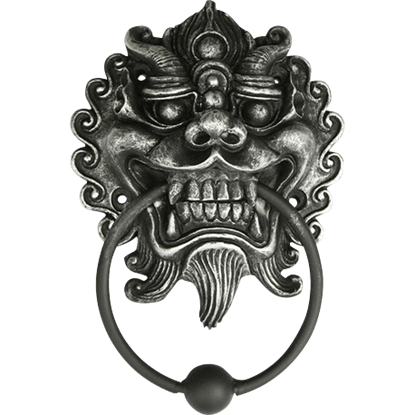 This Fanged Oriental Lion Door Knocker is the perfect way to implement this tradition into the decor of your home. Few elements from Japanese culture have pervaded common culture so extensively as the geisha, the traditional female hostess and entertainer. The Japanese Geisha Statue displays one such figure in her elegant garb. Wielding a nagamaki and displaying a traditional fighting stance, this samurai is completely focused on the upcoming battle. 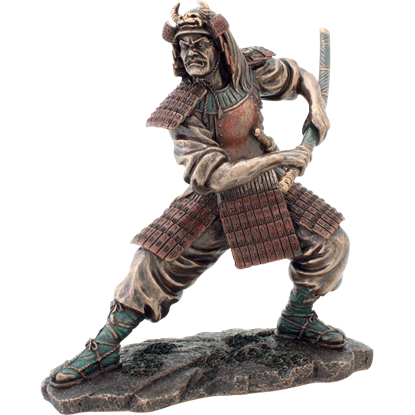 The Japanese Samurai Wielding Nagamaki makes an excellent addition to any Japanese or warrior collection. This armored samurai wears a kabuto adorned with deer antlers, similar to those worn by Japanese general Honda Tadakatsu. 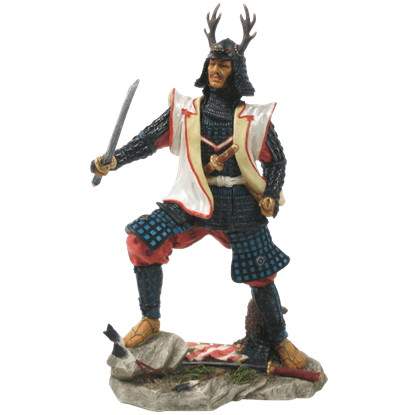 This Japanese Samurai with Antlered Kabuto makes a fearsome addition to any Asian or warrior collection. Dragons are not exclusive to the legends of medieval western Europe. 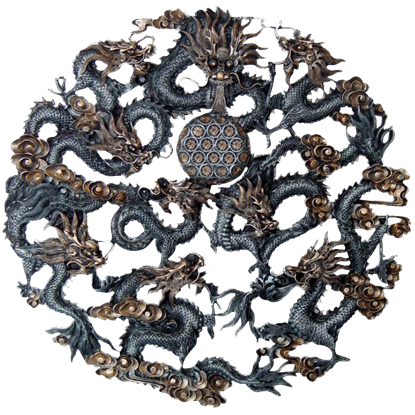 The Oriental Nine Dragons Plaque depicts nine dragons in a traditional Chinese mythology style, highly detailed and painted by hand in antiqued metallic hues.